MEXICAN CONSPIRACY OUTGENERALED. — Mexico is in the midst of a revolution. General Galvez, commanding the loyal Federal troops, seeks to obtain a loan from Harriman &. Tipps. Wall Street bankers. Herminia, a maid in the general’s household. overhears the conference and informs Tonio, colonel of the Rebels, who sends his spy, Karr, to New York to get the loan for the Rebel army. Unsuccessful, Karr robs the New York firm of the money and makes his escape to Mexico. Martha Langley, of the Tinkerton Detective Agency, is sent to Mexico immediately. Tipps also goes to Mexico to discuss the loan with General Galvez. Tipps leaves tbe general’s home and Karr enters secretly through a window to steal the Federal plans of attack. In the ensuing struggle be stabs General Galvez and makes his get-away unobserved. Tipps is arrested at the railway station and accused of the murder as the last one to leave the presence of the general. Martha picks up a hatband in the room where the struggle took place and sets out to find the real murderer. She falls into a trap laid for her by Karr’s desperadoes, and recovers consciousness with her luxuriant hair fastened in the drawer of a washstand. With a pair of manicure scissors, she cuts herself loose, digs a hole through the stone wall of her prison and escapes by swimming the river. Going to the home of the murdered general, Martha disguises herself as the maid and secures a note sent by Karr, the murderer. She brings about Karr’s capture and gets the U.S. Consul to intercede just in time to save Tipps from being lynched. After her heroic work in his behalf, Tipps quite naturally falls in love with Martha and persuades her to marry him. A year later they are shown in their Northern home with a little baby to bring them joy. 21. Mexican Conspiracy Outgeneraled (La conspiración mexicana descubierta). Producción: Warner. Actores: Martha Russell. Fuente: Moving Picture World, Vol. 16, núm. 3, abril 16, 1913, p. 314. Sinópsis: México está envuelto en una revolución. El general Gálvez, comandante de las tropas federales, intenta obtener un préstamo de Harriman & Tipps, banqueros de Wall Street. Herminia, la sirvienta del general, oye el plan y lo revela a Toño, un coronel de los revolucionarios que envía a un espía a Nueva York obteniendo el mismo préstamo, pero para el ejército rebelde. Muchas películas, sin embargo, presentaron bandidos mexicanos al estilo western que se hacían pasar por revolucionarios. Esa especie habitó cintas como The Insurrecto, Across the Mexican Line, The Mexican, The Honor of the Flag y The Señorita’s Conquest, todas de 1911, The Bravery of Dora (1912), Mexican Conspiracy Outgeneraled y Down on the Rio Grande (1913), Love’s Savage Hate (1914) y An Arizona Wooing (1915). Ya se verá cómo esa confusión intencionada acabó derivando en la simple y clara caracterización del revolucionario mexicano como un bandido, Pancho Villa mediante. 1300. 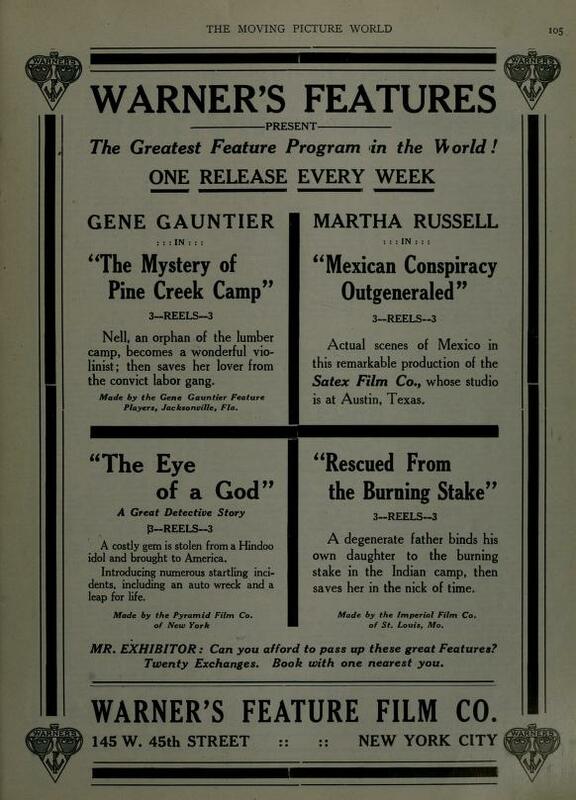 MEXICAN CONSPIRACY OUTGENERALED/ P EU (Satex/Warner’s) 1913. I Martha Russell. 3 r./ Drama sobre la revolución mexicana. El general federal Gálvez intenta obtener un préstamo de Harriman & Tipps, banqueros de Wall Street. Herminia, sirviente del general, oye el plan y se lo cuenta al coronel rebelde Toño, que envía un espía a Nueva York para hacer que el préstamo sea dado a los revolucionarios. Mientras tanto, los héroes norteamericanos combaten en la frontera a unos bandidos mexicanos que se fingen revolucionarios.